The reference to cloud computing typically relates to file storage solutions via a third party and web-based applications; they provide access to documents and files irrespective of location, from office based to on-the-go devices. Since the programs and documents aren’t stored on a physical hard drive, the data essentially exists in the ‘cloud’. A wide variety of opportunities are able to present themselves for the large organization to sole trader who wishes to benefit from the cloud service. 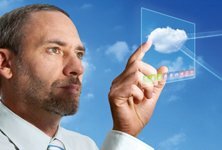 One of the simplest ways to get an introduction to the world of cloud computing is to sign-up to one of the web based applications which are highly efficient at helping to create and manage online documentation. Apple’s iWork, Microsoft Office Live, and Google Docs are three of the main contenders in the market at the present moment, although there are a wide range of other choices available. These online applications offer complete ease in creating, editing, and storing presentations, notes, spreadsheets, and documentations using a static device, like a home PC or a mobile device, like a tablet or smart phone. If you have a device capable of connecting to the Internet it has the potential to benefit from using the web-based cloud services. A great quality of the cloud service is that it offers the potential for key partners or employees to access the same document and witness live updates as they take place. If involved in a brainstorming session it is possible for multiple parties to access and get involved in real-time editing of a presentation or a spreadsheet which allows almost instantaneous changes on each worker’s PC. What’s more, when incorporate cloud computing with a web-based call or conference service, assignments such as document creation have the potential to advance significantly even when face-to-face contact isn’t possible. ZumoDrive, Amazon’s Cloud Drive and Apple’s iCloud are some of the more well-known cloud storage systems that offer the opportunity to sign-up to receive a certain volume of the cloud storage at zero cost, with an option of increased use at a fee. A significant amount of storage is available via the cloud services which can be purchased directly from the individual services or via third-party storage providers. A highly efficient cloud billing service can be used for helping to generate bills for data usage. If you are looking for an introduction of the potential of cloud storage you might want to sign-up for the free storage to establish is worth; progress from there if you wish to increase your storage options. A larger sized organization is likely to highly benefit from using the services of the cloud storage services since it will be possible to create single person user names and passwords which will permit workers to access specific documents and work on those from any location. It offers the opportunity to restrict access to certain documents that might be viewed by key personnel only. This is highly desirable for those companies that often have the workforce working outside of the main office environment. James Erskine is highly enthusiastic about the wide-range possibilities that the future holds for the ongoing and increasing popularity of cloud, including the cloud billing service packages.